So what do you think, should I try to write a small tutorail or guide on how to retrofit a PetPorte to an Arduino ? falcon14141 wrote: So what do you think, should I try to write a small tutorail or guide on how to retrofit a PetPorte to an Arduino ? It is nice to see that someone actually took all this time to make a real nice solution. I have two petporte units. One on the outside of the wall and one on the inside for a dual door setup. My main goal was to eliminate draft from the outside world. The second goal was to scan if a cat got in or went out which is nice since i have 5 cats and it is nice to now when they got out/in for the last time. is this not a beautiful idea for kickstarter ? I had some nasty encounters with this device. - Other cats would come in and mark our furniture with their urine. Flap was in normal day mode. - The foreign cat would be able to come in but not get out when in night mode. It destroyed a lot of plants. - The cat also fought my cat, leaving me with vet costs > EUR150. I emailed them, and asked them if the flap could be reporgrammed, so when a foreign RFID is read, the device would lock instead of not respond. That would prevent a foreign cat from pulling the flap open with it's claw/nails. I got a response to the effect that it was a good idea but I would need to sign all sorts of releases, then they could incorporate the idea. In the mean time, the flap is not function properly when a wind pushes against the flap. So, in stormy weather, the flap would open, but never close. So, there is no such thing as a cat proof, wind proof cat flap on the market today. If someone has homebrewed something, I'd be glad to hear. Reverse engineering a commercial product is a dangerous route to go. Otherwise, an open source public project would be something I would like to participate in. I have fixed this issue with an "Banden uitbalanceer gewicht" So the weight of the flap increased and this prevents the wind issues. But it still gives a cat the posibility to fiddle around to get it open. I`ve had the idee to build the flap myself using arduino but without success yet. I have received and tested mine. Be aware it is a much bigger door than the usual cat doors. You really need space for it. Not only the door itself but also around it. Everything feels sturdy. Solid and strong. Good quality and finish. Connecting the hub with the app and door works fine. Cat chip learning mode works fine and quick. You can then give a name and picture. I am not sure how much info goes to the servers but the app is pretty nice. Bit childish at some points and the handling of multiple cats on the same screen is not possible except in report mode. Push messages when a cat comes in or goes out work fine. You can add different users with three levels of rights. Nice touch. Good and clear pannel with a protective cover, Clear LCD screen with symbols. Alle well done and thought off. It's recording if a cat comes in or goes out. The range between hub and cat door seems limited. The door only runs on batteries and these are rated for max 6 months. I understand it makes mounting it in a door easier but it really needs an option for an external power supply. I don't want to be on holiday and find my cats locked out. The app shows the battery status so that helps. I have had not much chance to test but it seems the cat needs to be really close to the door to be detected. With my current doors we have the antenna outside and they come in running and the door is open on time. It seems this door will stop them from running in. We will see. Especially since my cats like to sit in front of it and look through the door outside. Wonder if it is going to trigger a lot of false positives. There is not a lot of protection around the door, just some small brushes not touching the sides. Having it on a windy part of the house will give some leaking of wind. It seems hard to protect cat doors from leaking cold air and since this one is much bigger one it will leak more too. It's nice to see the first real 'connected' door and already a nice version too. Just came across this post whilst searching for a hack into my PetPorte. Im very interested in connecting the cat flap to my Loxone home automation system and was wondering if there is any News on the reprogramming of the PIC on the PetPorte. The board in my cat-flap is a 2009 ISS E so hoping its quite straight forward. As its a working cat-flap, don't want to 'brick it' if I can help it. Does anyone know where I can get an output from the RFID unit on the board, was thinking of using this in a raspberry pi and have full remote control over the catflap. If not, I might remove the catflap and get a microchip for testing and analysing the unit on the bench. I took a logic analyzer to the EUSART pins. There is no data being sent on the TX, and sending random data on RX does not provoke any response. The only action I see on these pins are that the JP5 pin5 (RC5 on the pic) is pulled low momentarily during at start up. Its around the same time as when the boot-up beep is heard. It is not an artifact of the beep itself as this does not happen on other beeps than the boot-up beep. There is some ripple on the lines, around 1Hz, probably syncronous with the RFID scans. I have enabled and disabled all of the undocumented extended modes (8 through to 13) without any change of the behaviuor of these pins. 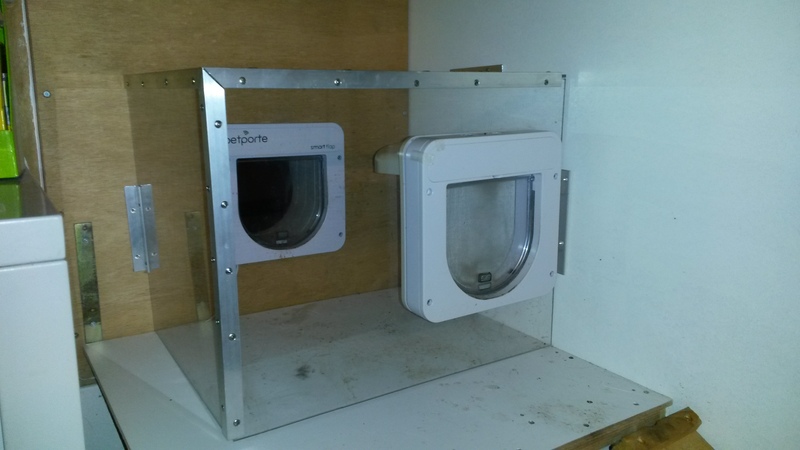 If there was a PC connection planned when the cat flap was released, they had to plan an upgrade by the customer. That means no soldering, no super-complicated button presses, no PCB replacement etc. I think they intended the extension to be autodetected. Possibly being activated by the extended modes. Autodetection would be prefered. I think the RC5 low-blip is a signal for the extension board to start communication. My thinking is that the extension module should react to that signal, and send some bytes to identify itself, within a certain amount of milliseconds. After that, the main board will start to send data. One way to test this would be to start sending random data to the RX pin as soon as the RC5 is pulled low. This might provoke some activity on the TX pin. It all depends on how picky the main board is on what data it expects. Is it just any old data, or is it a specific key, or a specific byte? It might be possible to brute-force it. Use an adruino to reboot the board (cut power), start sending bytes att the low-signal, monitor for TX activity. If none, redo with next byte.